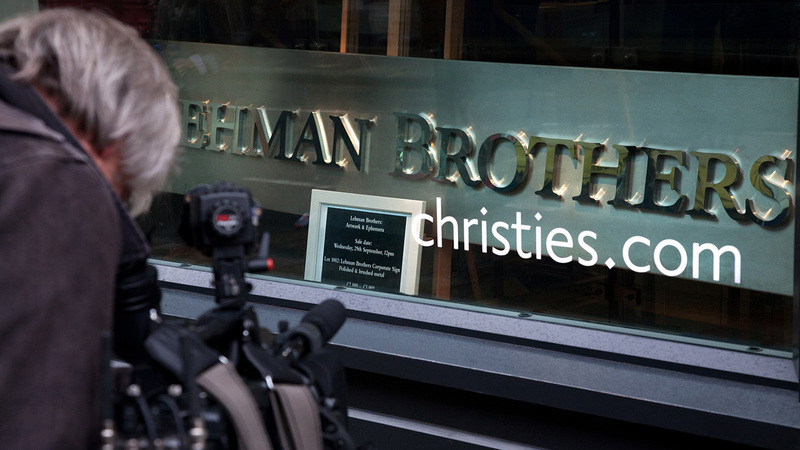 US investment bank Lehman Brothers filed for bankruptcy a decade ago, on 15 September – with $619bn of debt, it was the largest bankruptcy in history. Its collapse catalysed the global financial crisis. When Lehman bankers packed up their desks and exited the building, they started a trend, as bankers have been exiting business lending ever since. After Lehman imploded, banks rushed to protect their own balance sheets lest they follow it into the abyss. “The big high street banks needed to shore up their capital and had to block-off some of their lending pipes. They needed to get their risk levels down. Fast,” said Deloitte. Small businesses have borne the brunt of this. “The crisis has had detrimental consequences for borrowers and lenders; SMEs were most affected,” according to the OECD. In the UK, it wasn’t until 2015 that the decline in SME lending stopped and, 10 years on, it has yet to return to pre-crisis levels. You might think that the biggest impact was felt during the recession that followed, but that’s not how events have unfolded. Accessing capital remains difficult for businesses. In March, a Parliamentary enquiry heard that, not only was it tougher than ever to take out loans, but that “banks’ large legal teams are able to delay and frustrate small businesses’ claims and complaints beyond the six-year statute of limitations”. The regulatory response to Lehman’s – particularly Basel II’s capital adequacy rules – means that it’s unlikely that banks will ever fully re-engage with SMEs, as they are compelled to withdraw from many of their ‘riskier’ loans – a category that much lending to small businesses falls within, according to the Basel definition. Alongside cutting their loan book over the past decade, banks have also been compelled to cut costs – accelerating an already existing trend. “The impact of the financial crisis and the new regulatory costs bearing down on profits have made banks look again at the viability of their branch networks,” according to one Parliamentary report. The rate of bank closures has increased since 2016. Indeed, this year should outdo 2017, when 879 branches shut up shop, according to research by consumer rights group Which?. While there have been no official statistics on branch numbers since 2014, a Parliamentary report in August found that there had been a fall from 11,365 to 7,207 between 2007 and 2017 – a decline of 37%. This, says the report, is because “the crash and the resultant disruption to profits as well as the long-term downward pressure on profits (from higher capital charges and the end of profitable business lines like PPI) have forced banks to look for ways to cut costs”. Another recent report calculated that bank branch closures dampen SME lending growth by an average of 63% in postcodes that lose a bank branch, growing to 104% for postcodes that lose their last-bank-in-town. All this has combined to leave businesses chronically underfunded. But finance, like nature, abhors a vacuum, and the retreat of the banks has opened up space for more nimble, adaptive alternatives, in much the same way that a rather large asteroid made space for the mammals about 65m years ago. Fintech analyst Chris Skinner said “we are excited about new fintech as it destroys the fat overhead of old fintech”. Indeed – away with the fat cats, enter ThinCats. The latest UK Alternative Finance Industry Report found that in 2016, altfi funding for start-ups and SMEs grew by 50 per cent, from £2.2bn to £3.3bn, as 33,000 firms utilised used the sector to raise funding. Business lending platforms are now facilitating the equivalent of 6.6% of all new loans lent to SMEs, or 15 per cent of all new loans lent to small businesses by all UK banks. The direct lending market – from challenger banks such as Aldermore through to crowdfunding – has developed considerably over the past few years, and has helped to develop a group of highly-professional participants. Possibly the most significant element of this maturation is the entry of institutional capital. Analysts have noted the “increased involvement from institutional investors” in the sector, as pension funds and the like have woken up to the attractive risk-adjusted returns compared to other debt investments. Their entry into the market has also added to its increased professionalism, as they bring their own tried and tested due diligence and risk management processes. There is still some way to go. 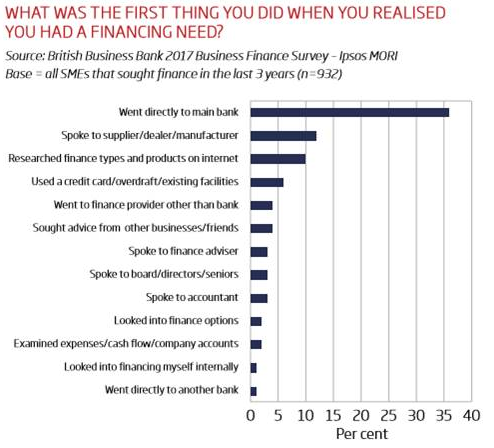 While altfi has become a significant player in the SME lending market, the gap between what companies need and what they are accessing is still considerable. What’s more, it’s holding back development. To a large extent, this is because many business owners are unaware of the alternative of altfi. A recent report concluded that many SMEs are not using the right types of finance: micro SMEs are reliant on personal savings; overdrafts are overused by SMEs of all sizes to fund growth; personal credit cards are regularly used to meet cash flow needs. Speaking to a broker or investigating alternative financing comes well down business owners’ choice of options, as the chart below demonstrates. This, of course, is why we need to get the word out. SMEs are being told ‘no’ far too often, or when they are getting a positive response may well be paying too much for the privilege or are tapping into capital that may not be optimally structured for their business’ needs. Those SMEs looking for amounts between £500,000 and £10m are particularly underserved, and it is that area of the market that ThinCats focuses on. We do it with professionals who have considerable experience in SME finance. All those people working in corporate finance a decade ago didn’t just fall off the edge of the world when the banks contracted. Some have taken their invaluable experience to altfi. Ultimately, while the collapse of Lehman’s was devastating, it was an (extreme) example of capitalism’s creative destruction. The fracturing of traditional banking models has allowed the growth of alternatives – alternatives that are better suited to support SMEs’ capital needs.